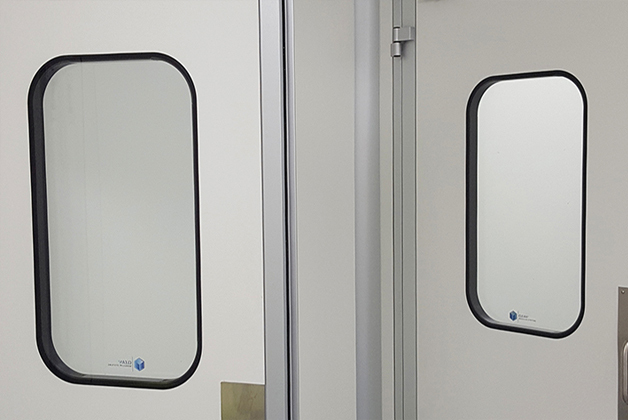 All of our CLEAN3 Systems include integrated Cleanroom windows for wall panels and doors. Also, our double glazed windows fit flush with both surfaces of the wall panel system. Each unit combines two panels of laminated safety glass and a layer of PVC film. In addition, the window system includes a micro-perforation profile and Silicone seal. Further, the rounded corners enhance the window appearance and add strength to the unit. Lastly, tempered glass (instead of the laminated glass) is available upon request.